of the voices of our NZ rivers, across the issues of history, ecology, hydrology and water quality issues. 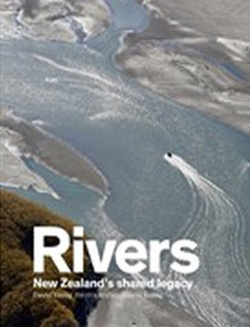 RIVERS New Zealand’s shared legacy recognises the importance of our rivers in all their power, tranquillity and fragility. Rivers are intrinsic to the New Zealand psyche as well as its dynamic landscape. Celebrating, promoting and protecting them go hand-in-hand. The book shows how rivers represent constancy, connect us to a Polynesian and a European past as well as to futures as yet unlived. In the now of an era of speed and greed, rivers remind us that slow-time, long-term decisions must be given space in our deliberations about whether and how engage with nature. We cannot take our rivers for granted. We draw upon them for everything from life itself to sustaining our economic well-being to recreational use. Rivers provide inspiration and contemplation; they also reflect liberties taken, assumptions made. Inscribed in the memory of water too can be the expression of collective wisdom - of precaution and care and katitakitanga that will best serve both land and people. The decisions we each make, in a myriad of ways in regard to rivers, are a function of the quality not only of our environment but also the equally precious and fragile democracy we inhabit. Footnote: Definition of Kaitiakitanga means guardianship and protection. It is a way of managing the environment, based on the Māori world view. and daughter of the author, has illustrated RIVERS with wonderful photographs. There are also maps of the various river systems and historic black & white photos.